Pursuing higher education in Houston does not have to mean that students are tethered to one city—or even one country—the entire time they are in school. Below, we’ve laid out the four best Houston international MBA programs. 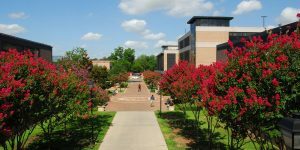 The University of Houston’s C.T. Bauer College of Business offers several options for aspiring MBAs who want to learn to navigate the global marketplace. All of Bauer’s Executive MBA students have the opportunity to do an International Business Residency (IBR) between their first and second years. Each class travels together to a country determined in advance by program coordinators. The IBR is seven days long, and students will use these days to meet with foreign political figures, experience the country’s culture, and tour global companies. Bauer also offers a Global Leadership Executive MBA for students who want their entire education to focus on a broader perspective of business. Students can also apply for the Global Energy Executive MBA to obtain a greater understanding of the expansive energy industry. Bauer grad students can choose from a variety of study abroad programs in places like India, Berlin, Chile, China, and Paris. MBA students at the Cameron School of Business can choose to pursue a concentration in international business, that will include a plethora of courses that provide insight into the global economy. All MBA students can seek approval from the dean or associate dean to receive elective credit for the study abroad course, MBA 5394: Special Topics. This option is provided during the Summer II session of the program. At Rice University’s Jones Graduate School of Business, all full-time MBA students take a Global Immersion Program. Students participate in this program in May after their first year of school, lasting from seven to ten days. In May, 2018, full-time MBA students will travel to Brazil to do consulting projects for different companies. This program is highly beneficial, as students’ roles within the abroad projects are tailored to their specific concentrations. Rice also offers Global Intersessions, in which professors spearhead trips to different countries. The 2017 and 2018 Intersessions will take place in China and Colombia. In addition to the Global Immersion Program and Global Intersessions, Rice students can international seminars abroad, generally hosted by other business schools. The University of Houston-Downtown offers an MBA in International Business that is specifically geared toward students seeking careers in risk management, finance, and supply chain management within a global corporation. To earn this degree, students must take 10 separate core courses, not including the courses required for their concentration. This program can be completed in 12 months, and is designed to help students become comfortable with international finance markets, the laws of international business, strategic sourcing and purchasing, as well as a host of other topics.